How to calculate the absolute reticulocyte count? 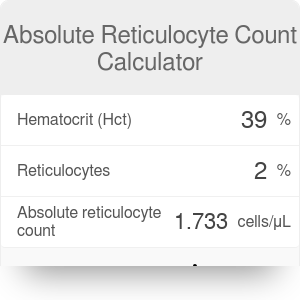 The absolute reticulocyte count calculator estimates the number of reticulocytes in the patient's blood. The values needed for the calculation are the patient's reticulocyte percentage and their hematocrit. In the advanced mode, there is also an option to input a desired normal hematocrit value. If you read on, you can learn what reticulocyte count is and how to estimate it. The absolute reticulocyte count is a quantitative measure of the bone marrow's production of new red blood cells. It's used as a marker of red cell production and helps in distinguishing hypo- and hyperproliferative anemias. The normal reticulocyte count in a healthy person is 26-130 cells/μL. In an anemic patient, a higher than normal level of reticulocytes can indicate an appropriate elevation of red blood cell production as a reaction to the anemia. A very high number of reticulocytes in the blood can be described as reticulocytosis. A low reticulocyte level informs us about a decreased bone marrow response. It can be induced by chemotherapy, aplastic anemia, pernicious anemia, bone marrow malignancies, problems of erythropoietin production, various vitamin or mineral deficiencies (iron, vitamin B12, folic acid), and chronic disease states (anemia of chronic disease). In highly anemic patients, the result can be misleading. To have a better perspective of the patient's reticulocyte count, we advise you to use our corrected reticulocyte count calculator. It uses the percentage of reticulocytes among red blood cells and one's hematocrit (Hct). The normal_Hematocrit is a default value of 45%, but if you wish, change it to the desired value in the advanced mode. The calculated absolute reticulocyte count is expressed in cells per microliter (cells/μL). Absolute Reticulocyte Count Calculator can be embedded on your website to enrich the content you wrote and make it easier for your visitors to understand your message.